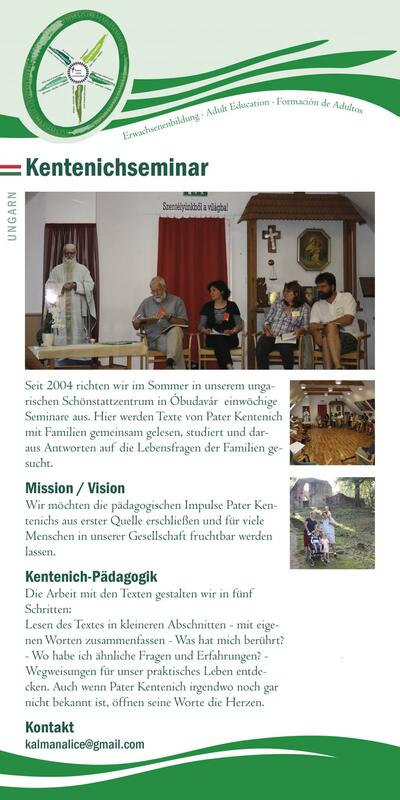 Since Summer 2004 we have conducted a one-week seminar in our Hungarian Schoenstatt Centre at Óbudavár. Here we read texts from Fr Kentenich‘s works with families, study them and look for answers from them for the vital questions of the families. The first seminar in 2004 was followed in the next six months by further work in two smaller family groups. What matters to us is to find Fr Kentenich‘s pedagogical incentives from primary sources, and to make them available and fruiful to many people in our society. The work with the texts follows five basic steps: Reading the text in short paragraphs - Summarise the ideas of what has been read in one‘s own words - What touched me most in the text? - Studying the text: Where do I have similar questions and experiences? - What can we do? Discover pointers for our practical lives.